Learn about Music City Nashville's history, visit an 1800's print shop, cruise on a riverboat, and see the Parthenon without ever leaving the South — and at great prices to boot. When the "100-year-flood" of the Cumberland River hit Nashville during the rains of May 2010, the roiling waters took down the The Opryland Hotel, the Grand Ol' Opry, the Country Music Hall of Fame and many other musical venues — costing the city hundreds of millions of dollars in lost revenue from business and leisure travelers. Fortunately, Nashville, Tennessee still holds the distinct honor of being the "Home of American Music" thanks to the perserverence of its residents who worked tirelessly to restore it. Despite extensive damage to many hotels, funky clubs and concert halls, the city is back, better than ever. Budding songwriters can be heard performing rock, folk, blues, and country year-round at the acclaimed Bluebird Cafe (4104 Hillsboro Pike, Nashville, TN 37215; 615/383-1461), where it's not unusual to see music's finest and most famous sitting front and center. But it's not just music and rowdy honky tonks like Tootsie's (422 Broadway, Nashville, TN 37203; 615/726-0463) in Tennessee's thriving capital, it's also home to the historical farm of President Andrew Jackson, the world's only hall of fame for behind the scenes musicians, and Vanderbilt University. Stroll through downtown to take in some local flavor over dinner and live music at Sambuca's (601 12th Ave South, Nashville, TN 37203; 615/248-2888,) in the developing urban area known as the Gulch. While the South is known for hot, humid summers, Nashville is frequently greeted with a refreshing breeze off the Cumberland River and shade from its tree-lined streets. Many local hotels are scattered throughout the city with proximity to Vanderbilt, west end, and music row; but for convenience to downtown Nashville and within walking distance to many of the attractions listed below, consider the world's largest Holiday Inn Express (920 Broadway, Nashville, TN 37203; 888-HOLIDAY, 615/244-0150) located just across the street from the Frist Center of Visual Arts. You can take advantage of special citywide savings and discounts by purchasing Nashville's Total Access Attractions Pass for entry to 16 venues, many reviewed here. For more information on attractions, lodging, and dining in Nashville, please contact Visit Music City (800/657-6910 ), the city's Convention & Visitor's Bureau. A Cowboy Town caters to the cowboy and cowgirl in all of us, taking visitors back in time for old-fashioned entertainment and fun. Explore 116-acres of valley at Ramblin' Breeze just 10 minutes from downtown Nashville for Wild West Gunfights, horseback riding, live cowboy music, canoeing, hiking, live music, camping, picnics, fishing, bonfires, hayrides, cookouts and more. Adventure Science Center brings the universe to your fingertips with hands-on, interactive exhibits. Test your knowledge with space exploration tools, a two-story high astronaut training and technology simulation, walk through the solar system, and learn about the planets. The BlueMax flight exhibit allows two people take flight and control flips, loops, spins, and dives for a unique flying experience. Explore Adventure Tower and lift a car right off the ground or scale a human epidermis wall of skin. Daily animal shows and keeper talks help kids learn about the of animals – a variety of frogs and toads, leopard, cougar, porcupine, lemur, Piranha, red panda and many more creatures scaly, fury, and feathered that call this zoo their home. Opening in 2013, a new exhibit "Kangaroo Kickabout" will feature animals from down under. There is also a fun jungle gym, carousel and train ride to round out your kid's visit. Visit an authentic Dukes of Hazzard Museum and theme store operated by Ben "Cooter" Jones himself. Explore photos, props, memorabilia, the General Lee, and even meet original members from the cast. Learn about Cooter's time on the infamous show, his tenure in the United States Congress, and his life now. You can also purchase DVD's, books, shirts, hats, and posters at the General Store. See a complete history of country music's finest performers in this vast collection of memorabilia, videos, costumes, and even cars. Everything has been spiffed up since the flood, and the influx of musicians who did charity concerts to raise funds for the restoration work have added a fresh glitter of celebrity to the place, Catch a glimpse of Elvis' infamous gold Cadillac, a history of Hank Williams and his offspring of performers, clips from Hee-Haw, and awards. The museum also houses an educational series to engage students, teachers, families, and the public. The programs explore music, art, songwriting, and stories told in the museum's exhibitions. Due to open in May of 2013 is the CMHoF's expanded facilities which will include the Music City Center (new home of the Nashville Songwriters Hall of Fame), and an Omni Hotel. The Frist Center features a collection of exhibits and hands-on learning opportunities for children. And with free admission for kids 18-years-old and under, the Frist caters to families on a budget and was voted #1 Kids Art Center and #1 Museum by Nashville Parent Magazine. Stop by the museum's Art Quest station for over 30 interactive exhibits including collage making, painting, sketching, and building. Young guests can also learn about photography, architecture, and the essentials of art, including depth, color, light, and perspective. This world famous print shop has been creating posters for the country music business and beyond since the 1800's. Conveniently located on Broadway in between lively honky tonks and around the corner from Ryman Theater, the shop lets visitors brows prints and posters for purchase and watch new designs being created on old-fashioned presses. You'll see a collection of prints from Duke Ellington to Leon Redbone hanging on their walls. Keep an eye out for the Hatch Show cats lingering near the register and soliciting affection from visitors. Currently closed, this museum will re-open downtown at the Nashville Municipal Auditorium at 417 4th Ave NW. Check their site for updates. Aspiring musicians head to The Musicians Hall of Fame and Museum, the only museum in the world that recognizes and honors the musicians behind some of the greatest recordings in music. After a short video learning about the history of Nashville's historical musical roots, see Jimi Hendrix's guitar, photos from Garth Brooks recordings, and learn about session drummer Hal Blaine who played with Elvis, Frank Sinatra, and The Beach Boys. Photos, memorabilia, and gold records are also on display to educate visitors about the greatest songs in history from musicians from Hank Williams to the Red Hot Chili Peppers. While the museum has plenty of country roots, it also showcases Nashville's involvement with Ray Charles, Paul McCartney, No Doubt, John Mayer, Gladys Knight, and Sheryl Crow among many others. Spend a hot summer day cooling off at Nashville Shores, a fun local waterpark. Attractions, rides, and slides include Music City Racers, Wacky Pond, Tennessee Twisters, Suntan Lagoon, and The Hippo. Or you can take the family out for a day on J. Percy Priest Lake for water skiing, kayaking, and boat rides. Note that these attractions are open only from late spring to early fall, with extended hours during summer. Visit a life-sized replica of the historical Parthenon in the center of Nashville's Centennial Park. Built in 1897 for Nashville's Centennial Exposition; the building also serves as Nashville's Art Museum boasting Greek artifacts and paintings on display. You'll also see a permanent collection of paintings by 19th and 20th century American artists, as well as information on the Centennial Exposition. Upstairs, guests are treated to a re-creation of the 42-foot statue of Athena. At the time Athena was built, she was the largest statue sculpted by a female and serves as a monument to classical art. Nestled on 30-acres just 6-miles west of Nashville, this Greek revival home was built in 1853 and housed five generations of the original owners of the Belle Meade Farm. The farm once encompassed 5,400-acres and was a breeding ground for thoroughbred and championship racehorses. Recent Kentucky derby winners including Funny Cide and Barbarro can trace their bloodlines back to the stock at Belle Meade. Tours are offered of the mansion to learn about the original home's Harding-Jackson family, the slaves that worked the farm, the Civil War, and daily life in the 19th century. An Italian-style villa built during 1849 under the supervision of Adelicia and Joseph Acklen, the mansion housed 36 rooms and 19,000 square feet with an art gallery, conservatories, lavish gardens, aviary, lake and even a zoo. Adelicia frequently traveled to Europe where she began collecting art, including five major marble statues from Rome, which remain on display in the mansion today. Tours, lunches, dinners, and free twilight festivals are now open to the public. Kids can attend scavenger hunts, archaeological digs, Victorian-period art activities, music, and watch authentic Barbershop quartet singers and live performances by Shakespearean actors and puppeteers. A petting zoo with owls, sloth, creepy crawlers and more are also on display. What does the South, coffee and lush flowers all have in common? How about a 55-acre historic estate and botanical garden built by the heirs to the Maxwell House Coffee Fortune in 1932? Recently named one of the "Top Five Must-See Southern Gardens" by Southern Living, the grounds also house a Museum of Art inside this Georgian-style mansion. The estate also features the original Cheek gardens, pools, fountains, statuary, boxwood plantings and views of the Tennessee hills. Climb aboard a 300 foot paddlewheel riverboat for a cruise around Cumberland River complete with live entertainment in a two-story Victorian Theater in the center of the boat. Named General Jackson after the first steamboat to operate on the Cumberland River in 1817, the modern version was christened in 1985. Midday cruises from mid-March through early November feature Peking acrobatic entertainment and lunch. Evening dinner cruises and holiday tours are also available with live music. A visit to Nashville is not complete without a visit to the newest theater for the Grand Ole Opry, home to the longest running radio broadcast in the world. Take a behind the scenes tour or purchase tickets for a performance by Carrie Underwood, Garth Brooks, Alan Jackson and more. A 6-foot circle of well-worn oak rests in the middle of the stage, cut right from the stage of the Opry's former home, the Ryman Auditorium. This historical spot allows visitors and performers to stand on the exact spot where country's legends once stood and entertained. Explore the home of our nation's seventh President and learn about his family, life on the 1837 farm, cabins, and explore the exhibit gallery. Seasonal tours are lead by guides in period costumes and explore the grounds formal gardens, slave quarters, mansion, and original log cabin. Families can also learn about the daily life and struggles of enslaved African Americans on the Hermitage's 1,100-acre plantation that once housed 150 slaves who worked the farm, cared for livestock, baled cotton, and grew its gardens. Located within walking distance of the Grand Ole Opry and Gaylord Resort, the Opry Mills mall offers a 20 screen movie theater, restaurants, and dozens of retailers including fashion, jewelry, accessories, and more. The specialty Aquarium Restaurant offers a unique underwater dining experience where you can dine among marine life. Plan your visit around a boat ride at the neighboring Opryland Resort or performance at The Grand Ole Opry. The Gaylord Opryland Resort, the flagship of the Gaylord Hotels, is unlike any other, and it's actually the largest non-casino hotel in the country with 2,882 rooms and suites. The property reopened in November 2010, after a $200 million restoration to repair flood damage and refresh its public spaces, sprucing up the luxury rooms, lush indoor gardens, atrium with water facilities, nightclub, fine dining, spa and shopping venues. Anyone can stop by the resort to explore the grounds and dine. Families looking to spend the night can inquire about special packages for savings at the nearby Grand Ole Opry or Opry Mills Mall. The "Home of American Music", The Grand Ole Opry started as a simple radio broadcast in 1925 and paved the way for a modern phenomenon. While the Ryman Theater wasn't the first home to the Grand Ole Opry broadcast, it is arguably its most memorable and historical venue. From June 5, 1943 to March 15, 1974, the Ryman featured musical and comedic acts from legendary performers Minnie Pearl, Johnny Cash, Dolly Parton, Loretta Lynn and many others. Today, the Ryman (newly refurbished after flood damage) offers tours, photos, and country memorabilia and also showcases rock, gospel, jazz, classical, bluegrass, alternative, and musical theater. This historic house and museum, the oldest in the area, presents the public with collections and grounds that represent Native American through Civil War life in Middle Tennessee. Judge John Overton, one of the state's first Supreme Court Justices and founder of Memphis, occupied the house from 1789 to 1833. Special tours include The Last Campaign, a look at the Battle of Nashville where Travellers Rest served as the headquarters for Confederate general John Bell Hood. 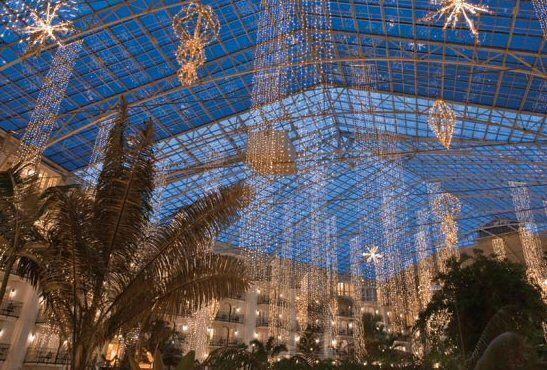 The Gaylord Resort is a great place, although it's a bit far from downtown Nashville. But if you don't mind driving a bit, it's an empire unto itself and older kids can amuse themselves for hours just exploring the place.